Though she believed her main role in life to be wife and mother, Abigail Adams also was a behind-the-scenes stateswoman. She used her talents to maintain her family during the many absences of her husband, John Adams, the second president of the United States, and to advise her husband about women's rights and slavery. Her detailed letters with her husband, family, and friends provide a historical record of the times and show her to have been a woman ahead of her time. Abigail Smith was born in Weymouth, Massachusetts, on November 11, 1744, to William and Elizabeth Quincy Smith. Her well-educated father was the minister of the North Parish Congregational Church of Weymouth. Although many of Abigail's relatives were well-to-do merchants and ship captains, she was raised in a simple, rural setting. She was educated at home, learning domestic skills, such as sewing, fine needle-work, and cooking, along with reading and writing. She took advantage of her father's extensive library to broaden her knowledge. Her lack of formal education became a life-long regret. As an adult, she favored equal education for women. She once argued that educated mothers raise educated children. 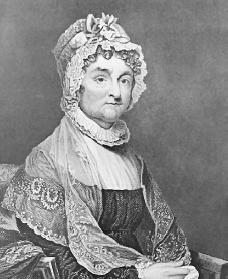 On October 25, 1764, Abigail married John Adams, a struggling, Harvard-educated country lawyer nine years her senior. Although John Adams was not from a prominent family, the couple was well matched intellectually and the marriage was a happy one. He admired and encouraged Abigail's outspokenness and intelligence. She supported him by running the family farm, raising their children, listening to him, and trying to help him with his problems. During the first few years of their marriage, John Adams lived mostly in Boston, Massachusetts, building his law career and becoming involved with the growing political unrest. This political unrest was brought about by the English government's attempts to tighten control over its colonies through the passage of laws and new taxes that many colonists did not support. Abigail, however, remained at Braintree (later Quincy), Massachusetts, to run the family farm. Although women at that time did not normally handle business affairs, Abigail traded livestock, hired help, bought land, oversaw construction, and supervised the planting and harvesting. "I hope in time to have the reputation of being as good a Farmess as my partner has of being a good Statesman," she once wrote. During the next few years, hostilities between the American colonies and Great Britain increased, forcing John Adams away from home more often. He was chosen as a delegate to the First Continental Congress. (The congress was a group of colonial representatives who met in Philadelphia, Pennsylvania, on September 5, 1774, and took a stand against the British government's policy of passing laws over the colonists without colonial representation.) He traveled constantly in addition to those duties, trying to earn as much money as he could practicing law. He tried to make these difficult times easier by writing long letters to Abigail, sometimes several a day. She, in turn, wrote to her husband of her own loneliness, doubts, and fears. She suffered from migraines and chronic insomnia. Despite her own bouts with illness, she gave birth to five children. One daughter, Susanna, born in 1768, lived for only a year. and night. In the fall of 1775, the inhabitants of Braintree suffered an epidemic of dysentery, an often-fatal bowel infection. Abigail had to nurse her sick relatives in addition to caring for her children. Her mother and five other members of her family eventually died from the illness. As the fighting drew closer to Boston, Abigail Adams wrote many letters describing the events of the time. In a letter written in March 1776, she urged her husband to take women's rights into consideration if and when the colonies gained independence: "In the new code of laws which I suppose it will be necessary for you to make, I desire you would remember the ladies and be more generous and favorable to them than your ancestors … If particular care and attention is not paid to the ladies, we are determined to foment [promote] a rebellion, and will not hold ourselves bound by any laws in which we have no voice or representation." As the war continued, John Adams was sent to Europe to work on treaties with other countries and to seek loans for the colonies. He took one or two of his sons on these assignments, which continued after the war ended, giving America its independence from Great Britain in 1883. These constant separations were difficult for Abigail Adams, but she supported her husband. She wrote that she "found his honor and reputation much dearer to [her] than [her] own present pleasure and happiness." After five years, Abigail and her daughter, Nabby, joined her husband and sons in England. During the years in Europe, Abigail acted as hostess for both political and social gatherings and as an advisor to her husband. In April 1788, five years after Abigail's arrival, the family returned home. After the American Revolution ended, the newly independent country of the United States needed a president. When the votes were counted in March 1789, George Washington (1732–1799) was the clear presidential winner. At the time, the person with the most votes became president, while the person with the next largest number became vice president. John Adams placed second and became vice president. Although Abigail Adams had been upset by her husband's earlier political assignments, which forced him to be away from home for years at a time, she fully supported his decision to accept the vice presidency. The family moved to Philadelphia, Pennsylvania, where the federal government was located at the time. Abigail assumed the role of hostess, welcoming visitors to the Adams's home. However, she returned to Braintree the next spring with her son, Thomas, who had fallen ill. When Washington retired in 1797, John Adams ran for president and won the election. His wife joined him in Philadelphia in May. Abigail Adams quickly settled in as first lady; her husband discussed many important problems with her and often followed her advice. Abigail kept writing letters to friends and even continued managing the Quincy (formerly Braintree) farm through correspondence with her sister, Mary Cranch. Whereas John Adams had never been in finer spirits, Abigail Adams became exhausted and ill with fever on a trip home to Quincy in the summer of 1797. This led to yet another separation when the president returned to Philadelphia in November. Abigail eventually recovered and returned to Philadelphia the next year, staying for the rest of her husband's term. After losing his bid for reelection in 1800, John Adams retired to life on the farm. Abigail Adams continued to keep herself busy maintaining her home. The family remained plagued with illness. Both Mary Cranch and her husband died within days of each other. Nabby Adams had been diagnosed with cancer and underwent an operation. John Adams injured his leg in an accident and was unable to walk for several weeks. As always, Abigail Adams cared for them all. In October of 1818, Abigail Adams suffered a stroke. She died quietly on October 28, 1818, surrounded by her family. John Adams lived several more years, passing away on July 4, 1826. Abigail Adams has the distinction of being the first woman in U.S. history to be the wife of one president (John Adams) and the mother of another (John Quincy Adams [1767–1848]). Akers, Charles W. Abigail Adams. New York: Longman, 2000. Bober, Natalie S. Abigail Adams. New York: Atheneum Books for Young Readers, 1995. Butterfield, L. H., et al., eds. The Book of Abigail and John: Selected Letters of the Adams Family, 1762–1784. Cambridge, MA: Harvard University Press, 1975. Nagel, Paul C. The Adams Women. New York: Oxford University Press, 1987.
this Article was helpful for one of my report on Abigail Adams 100% helpful! Abigail Adams is cool American History is fun but I want it to be translated into Korean please.